Creed of Kings Saga: An unpublished sample of my style. Funny thing is, all this is going to change after the tons of the restructure and revision that I’m currently working. What the heck. I’ll leave it up for now. There is resonance here that won’t be felt due to the reader being unaware of the larger scope. There is also foreshadowing for things that happen one hundred pages later. However, this is one scene where there’s a tad bit of resolution, one of the few scenes that does not end with a cliff hanger. That’s kind of why I chose it. I probably made some typos, It’s nearly impossible not to make mistakes. “Father?” It felt as if he was lying on a sack of potatoes, riding in the back of a cart on his father’s estate. Father’s voice echoed as if he was in the hallway down from Markin’s room. He rubbed his head. It felt as if a woodpile had landed on it. “The sun rises. Fill your heart with its hope. You have much to do.” His father appeared in the doorway. Mother must be overseeing breakfast, he thought. The scent was not the aroma to which he was accustomed. Markin wanted to see the family estate of his childhood. He removed the warm covers, flung his legs over the edge, but dropped feet first into a deep hole and landed on pile of stiff, rotting bodies. He tried to stand, but his head was spinning. He collapsed backward. Markin felt an ocean of thoughts he couldn’t understand. I don’t know. He rubbed his head again. Markin pried his eyes open. Through the blurred slits, he saw an arm throw an object into the pit. Then he felt a jolt and something hot. His eyes cleared and he saw a dead man’s face frozen in terror looking at him. He pushed him away. He tried to stand again on the shifting dead. Smoke billowed up from a crevice in the heap of bodies. Still wobbling, he looked up. Another torch fluttered in igniting grimy clothing behind a cluster of lifeless limbs. Another wave of nausea churned. He bent over but only heaved to discover his feet were bare. With each stumbling step, he felt rigid limbs and bloated bellies against his feet as he groped for the wall of the pit. He dug his fingers into the dirt and climbed up the steep slant. He slid back several times into the pit before hoisting himself out. The cart had topped the hill and was heading down the other side. Markin crawled toward the hill, reached out a hand, tried to yell, but fell over dizzy and exhausted. “Never give up, son,” His father’s voice retreated into his memory. He woke up coughing. Smoke, flame, and choking stench belched from the hole. He struggled to his feet and stumbled away. The smoke engulfed him. He swept his hair back to look around and shuddered when he felt the painful lump. He turned and walked out of the stream of smoke. The scene from the pub, the gang of fools, and the old man came flooding back. He pieced the broken memories together. Where is Mott? How did I…? He pushed the scene out of his mind and tried to determine his position. Hunched over, he staggered to the edge of a precipice. The Rift Sea cut into the land below. In the valley, retreating shadows uncovered the city Bixle; beyond sprawled the Midvast westward into the horizon. His throbbing head interrupted concentration, but he found a path eventually. Barefoot and shirtless he began walking. The forest thickened, the branches joined overhead, and the path took on the feel of a corridor in King Honsa’s palace. Never give up? he questioned. He laughed without humor and trudged onward thinking of the sequence of misfortune and his stupidity. He had been the guardian of the king. Now, mere weeks later, he traipsed shamed and shirtless on a back road in a nameless wilderness. His mind wandered back into the king’s kitchen the day he found Mott slicing air with a meat cleaver. Markin propped his shoulder against the entrance, folded his arms, and watched Mott battle some imagined foe. “Gathishians?” inquired Markin, interrupting the hero. “I will, but when I return from the mission, no more.” Markin looked back at the door and leaned closer, “I will find a girl, fall in love, marry, and raise a tribe of offspring.” He smiled and opened his arms wide. Mott looked at him as if he had dropped rotten egg in an omelet. He turned to the table of meat and resumed chopping. “If that’s what you want…” he shrugged. “Then you’re crazy.” He waved at the palace with his meat cleaver with a piece of fat dangling from it. “Give up this?” he shook his head, smacked his lips and frowned. “People would die for what you have.” He went back to chopping harder than usual. My parents died, thought Markin as reality regained its hold. He looked down the trail while he carried futility’s weight and remembered his long-dead father’s words and repeated them aloud. “Never give up, son. You never know unless you keep going, son. What if you stop here but the answer is around the corner, son? What if the answer is not even there but beyond the next hill, son? Will you stay there, son? Never give up, son. It is not a waste, even if you find the truth at your last breath beyond many hills, son. Son, son, son! Never give up!” Only the trees listened. Markin was not sure if this was mocking his father as he questioned the wisdom of those words. The bottoms of his trousers were damp from dew and picking up dirt. He bent down to roll them up, then heard the scrape of a sword drawn from a scabbard. “Turn around slowly,” said a shaky voice. Only one? Markin’s eyes sought other movement. A Gathishian soldier in light armor, barely more than a boy, fidgeted on his feet, his sword periodically thrusting in Markin’s direction. “Divisius is scouting already.” Markin read bit of respect on the soldier’s face. “Who were you talking to?” The soldier’s eyes darted about. The fool took a breath. His sword bounced between alert and curious while he inched toward Markin. Markin’s stomach churned and his mouth was dry. Closer. “Step away, soldier!” Patrolling Gathishians came from a trail in the woods behind Markin. The tattoo’s spell lifted from the youth’s eyes and Markin hung his head. The leader ordered spears and arrows trained on Markin. They bound his wrists and led him into the forest. Another man snapped the tent cover aside and emerged, taller, bull-necked, and muscled. A jagged scar went from brow ridge to cheek leaving the left eye undamaged. The patrol snapped to attention. “This had better be import—” Markin’s tattoos froze him. He ordered the patrol away and strode back into the darkness of the tent. The short man held the tent flap open and motioned Markin inside. He saw a table when his eyes adjusted to the shade inside. On the table sat the sturdy ornate canister containing the message from Honsa to Ledarrin. The seam had pry marks but the lock remained intact. Markin tried not to exaggerate the appearance of calm when he saw it. Things of the king didn’t belong among these barbarians. “You will kill me if I don’t.” Markin sensed the man’s heart was a sinkhole. “Of course.” The short commander smiled. Scar pressed closer. He clenched his jaw so hard, Markin thought the man’s teeth would break. “Divisius will crush Bixle and all the cities along the border. A man like you should not be wasted on the hordes.” Markin felt the man’s breath ruffle his hair. Scar retreated a bit and appeared amused by the commander’s reverence for the Gathishian Emperor. Scar put a hand on the short man’s shoulder. “Away with your knife.” The commander stepped back. Scar glared at him and tilted his head indicating the exit. The commander pressed his lips, bowed, and left. Scar glanced at Markin’s tattoos. “Why aren’t you dead? You have already betrayed your king.” His lips snarled into a smile. Markin hung his head. “It’s over now.” His stomach churned. Scar called out to the commander. The short man appeared with soldiers. Guards jerked Markin’s elbows and led him out of the tent. The soldiers led him out, but on the way they seemed preoccupied. They kept looking in the same direction. Markin followed their gazes, but saw nothing obvious. “Here it is,” said one. They left the trail, pulling Markin with him. They’re going to beat me, he thought. He began bracing himself. As they wove through the forest, Markin began to discern what looked like a small building in the distance. “Keep quiet,” ordered one of the soldiers. Markin beheld something of which he had only seen drawings and statues in Balazyne. When he first saw it, it reminded him of a giant, furry archway. On one side of the arch sat a furry boulder and from that hung a huge snake-like trunk, the sniffing end hovered inches from the ground. At least that is how he drew a lurkadon as a child. The guards shoved him to the ground. Lying sideways, he tried to make sense of the immensity of this creature. The small building turned out to be a large cart. The lurkadon was reined to it like a horse to a carriage. In the drawings he had seen, they had tusks. This one did not, it must have been a female. He heard what sounded like a little trumpet. A small lurkadon was winding in and around the larger one’s trunk-like legs. The soldiers were not interested in the lurkadons and kept looking at a large gray boulder, flecked with green moss. Then the boulder moved, sending a sworm of flies up. The soldiers jolted, but did held their ground. The boulder came off the ground supported by thick bowed legs. It wore a torn, soiled loincloth. A yawn exposed canines the size of a man’s thumb. The yawn ended in a deep groan. It leaned forward exhausted and moped along dragging a chain attached to a collar as it walked on all fours. It was the first time Markin had seen an oggrin, a grey skinned humanoid of the forests. It was wide and half as tall as the lurkadon. “You have it?” one soldier said to the other. “Hold on.” The other pulled out a purple cloth and waved it at the oggrin. The oggrin hardly regarded them, but the big lurkadon reached out its trunk and pulled the little one close. “It’s the color they used.” The cloth flapped as the soldier waved it more vigorously. A trunk-shuddering roar shook Markin’s ears. The oggrin charged, barreling down at them, but was jerked hard and slammed on its back. It squirmed while it tore at the collar. It sprang back up and pounded the ground with its palms, sending puffs of dust from the forest floor as it howled and roared. One hand had three fingers, making it resemble a claw. Two missing fingers were scabbed nubs. Ripples of dust vibrated off the chain while it sagged and tensed with the oggrin’s lunges. It reached out, swatting at the Gathisian soilders. The limbs of the tree chained to the oggrin shook. A whip cracked. The oggrin cringed. A man emerged from behind the cart. Each time the whip snapped, the oggrin flinched and covered its hand. The man stomped out to the soldiers. The oggrin shied away behind the tree to which it was tethered. Its huge deep-set dark eyes peered out from under its shading palm. It curled an arm around the trunk. “Will you not give the creature a rest?” yelled the man. The soldiers were speechless. One had pissed his trousers, the other trembled and paled. They turned around. Markin saw their faces had lost color. As they pulled him up, he noticed the shoulders of the oggrin were heaving. Its head was hidden on the far side of the trunk. The soldiers scrambled up the incline. “Don’t forget your weapons, fellas,” Markin said. I’ll need those, he thought. The man with the whip shouted at the oggrin in guttural toned language. The oggrin could have thrown the man back to the camp, instead it hunkered down, crawled past him, hopped into the back of the cart, and crouched. The soldiers seemed happy having found weapons, but they only had their swords. “The bows and quivers, too,” Markin reminded. I’ll also need those, he thought. The oggrin master released the chain from the tree trunk. The oggrin pull the loosed chain into the cart. The man leaned against the heavy door and, with the help of the oggrin pulling from the inside, the hinges squawked. The oggrin’s eyes stared at Markin until concealed by the swinging door which screeched and thumped closed. The man clamped it shut. Before the soldiers pointed Markin back up the path, he saw the lurkadon release its little one for play. They threw him into a narrow fissure of the ridge wall. After he hit the ground, he heard a familiar cheerless chuckle. Markin affirmed and shivered remembering the death pit. Markin surveyed the cleft then looked at the entrance. “Still guarded by two I take it.” Mott surmised. “Yeah. The two that brought me relieved the others. That’ll change. They saw my tattoos.” Markin replied. “In the big tent,” Markin nodded toward the camp. “From the thief who stole it from us. He was begging for food. They found it on him—that was him!” Markin recalled the scene coming into the camp. “We’re not going to end up like that!” Markin blinked his eyes to erase the memory. “We got to get moving then,” said Mott. Markin drew his legs up and moved his bound wrist forward under his feet. He brought them up and wiggled his fingers. They alternated between chewing the ropes and grinding them on rocks. Markin told Mott of the oggrin and the lurkadon. Mott, being superstitious, believed it was all an omen, whether for good or ill, he did not know; he said, “I’m just a cook after all, not a holy man.” Finally, the bindings came unraveled as they heard distant thunder. The guards were talking about sneaking into Bixle for some fun when Markin came out of the darkness of the cave and ripped the sword from the guard had urinated in his trousers. The one who had waved the purple cloth gripped the handle on his sword, but before he yanked it out, Markin swung his newly acquired sword side arm and sliced the guard’s throat with the tip. The one deprived of his sword froze, then reached for the missing hilt, but Mott sent him to an unhappy nap with a fist from his beef-chopping arm. Markin removed the sleeping man’s sandals and tunic. The other guard squirmed. gasping and clutching his throat as life bubbled and wheezed out. He tossed a sword and dagger to Mott who stopped rubbing his knuckles to catch them. Markin collected the impressive bow with a quiver of arrows leaning against rock wall. He started into the forest but halted. Mott stepped over the sleeping guard to follow but bumped into Markin who had paused. They crept alongside the wall of rock and vanished into the forest that encircled the camp. He was sure guards would spot them soon, limiting the time needed to get to the message. “You saw the horses, right?” Markin whispered. “Sounds easy,” Mott whispered and then disappeared into the darkness. Markin shook his head at the sarcasm. He’s just a cook, Markin reminded himself. In the darkness, he was just another figure going about the business of the camp; he walked as casually as possible. The audacity of his plan filled him with fear and elation, but his face remained expressionless. Only confidence remained as he approached the tent, as if in a dream, and methodically pulled the bolt from the quiver. Never give up. He paused for a moment to fire the arrow. Lightning flashed and as the thunder sounded, the arrow went straight into the throat of the lone guard in front of the big tent. The guard clutched the shaft, sunk to his knees, and then crumpled–his armor sounding a faint clunk against the ground. Markin dropped the bow and quiver, stooped and mercifully ended the guard’s struggle with a swift stroke of the dagger. Suspecting the tent’s occupants heard the commotion, Markin rolled through the entrance. As predicted, someone was there, when the flap fluttered. The short commander swung his sword high and as expected, embedded the blade into the post. The commander jerked once to free the sword but it was all the time Markin needed. The man barely got out cry for help before Markin’s dagger went to hilt under the rib cage to the heart. He fell forward against Markin, staring up and hanging on as his life drained out. He weakened, let go, and dropped. No need for caution anymore. Though the commander’s cry had been weak, Markin, certain someone heard it, turned to the table to secure the bow and dagger. The message canister was gone. He swatted blankets, armor, and maps aside looking desperately. The tent flap opened. “What’s the—you!” Scar dropped the canister and drew his sword, a brilliant flash compared to bronze sword Markin wielded. Scar was in the early autumn of his years, but that did not inhibit the fluidness of the movements that declared many had died on his blade. Scar lunged, but Markin dodged the arching strike. Scar’s skill was great, his rage greater. He kept his balance and roared, launching a backhanded swipe. Markin ducked under the taller man’s swipe. The sword swooshed over his head and nearly scalped him. Without the expected contact with Markin’s neck, the anger in Scar’s swing caused him to stumble and crash into a cot. Markin glanced down. The canister rested at his feet. Scar recovered and began to turn; Markin seized the canister and scrambled out of the tent. You better be here Mott or we’re dead. As he quickly picked up the bow and quiver, he thought he heard the rumble of thunder while he secured the weapons, but, it was horses running, many horses; stampeding through camp as lightning flashed, Markin grinned. Mott had done his work. Perfect. He glanced back just in time to see Scar winding up, raising his sword in the air. Markin could only turn, but turning with a flash, he raised the only thing he had, the canister, to block Scar’s downward arc. He caught the full power of the strike directly on the lock. Sparks flew as the skies roared. The canister was shaken from his grip. Stunned, they both stared at it. Markin jerked his sword out and struck out but Scar easily parried his attempt to end the fight. Their swords clanged over the message. The sword Markin took from the guard was no where near as stout as Scar’s. The weaker sword sheared off. Markin, backed away stumbling, but gained his balance. With a useless sword handle in his grip, he stared back at Scar. Scar kept his sword up while leaning to pick up the canister. It was damaged. Markin heard the cylinder squeak. For the time it takes for a grain of sand to fall in the hourglass, Scar glanced down to grip the canister. “No!” shouted Markin, flinging his stunted sword in desperation. The hilt smacked Scar above the ear with a thumping slice and glanced off. Scar screamed, dropped his sword and the canister. He clutched his head and squirmed on the ground. Markin kicked him in the gut, sending him back a few feet, and grabbed the canister and the stout sword. 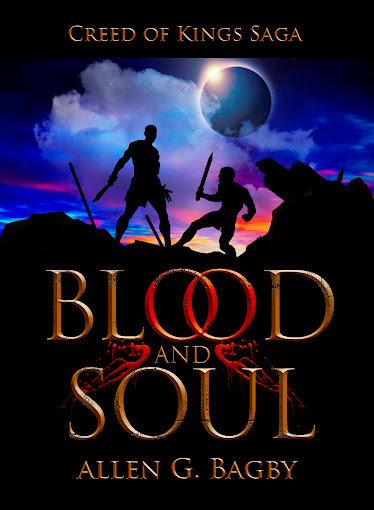 When lightning flashed, he saw blood flowing from between Scar’s fingers. Kill him! Markin thought as he gritted his teeth. But he turned to see Mott towering over him on horseback. He handed the canister up. “Hold it tight. It’s broken.” Markin gripped the sword handle and looked at Scar. Gathishians in various states of undress were running toward them. Markin tore himself away and leaped on the horse. He glanced back to see Scar holding his head looking for his sword. “Let’s go!” shouted Mott. An arrow flew by his head as lightning lit up the sky. Markin scrambled up the horse and he in Mott tore the camp like demons. They escaped as big drops of rain splashed on their faces. By the time they reached the edge of the forest, a downpour had extinguished many of the campfires. He and Mott disappeared into the gloom of the trees as Gathishians shouted cries of vengeance. Mott was laughing. Markin was thrilled having seized the chance to fulfill his oath. He felt sticky blood on his hands but the rain was washing it away. He had fought many times as King Honsa’s bodyguard. In all that time, he had injured many but only killed two men. He had killed twice that many in this one night—and now he was also a horse thief but he would not be an oath-breaker. They were soon lost in the darkness, but the sun would rise again. He had the message. I’ve found some good movies on Netflix. I end up watching a lot of foreign films. http://en.wikipedia.org/wiki/Max_Manus_(film) < this is one of the best war movies I have ever seen. I highly recommend it. Norwegian, english subtext. http://www.youtube.com/watch?v=WbK4WTQFf9U < here’s the trailer. I gave it 5 Stars on Netflix. It was refreshing to watch a non-Hollywood war movie. After the 70s, I think Hollywood made 2 or 3 war movies I actually liked. The reason war movies are not the hits they could be, is because they are so anti-military, anti-hero, usually. Hollywood can’t stop moralizing us about war. There is an overt cynicism and mockery of patriotism or being gung ho about fighting bad guys etc. Typical scenario: The soldier has discovered evil intentions of our government…over done trope.and thus turns against his fellows in search of the “truth”, a Matt Damon specialty. None of that typical crap is in Max Manus nor is it corny sentimental feel from the 50s type war movies. See it. I get all emotional watching the trailer now. Another refreshing foreign movie I saw last week was Aftershock: http://en.wikipedia.org/wiki/Aftershock_(film) < this is about a little girl who gets left behind when her mother has to make a choice between saving her or her twin brother after the 1976 earthquake in China. It’s perfectly named “Aftershock” for the shock the little girl feels as she hears her mother’s agonizing choice. An epic movie ensues. I loved it from the start. Very Spielbergish in the beginning, the tale of an abandoned child, but moves on from that into a sweeping huge family epic with an awesome ending. I’m always a sucker for these kinds of movies where the little kid has to survive, like in Empire of the Sun. Another 5 Stars. The pacifism/non-violence these icons used should not be a universal truth. The non-violence used by Gandhi and MLK was a method used in correct circumstances. I don’t know if MLK would have used it in all cases, I do know Gandhi would have. If MLK or Gandhi would have tried non-violence in Taliban Afghanistan or Nazi Germany they would’ve been beheaded or gassed and thus ending their great moral movements. Pacifism assumes everyone is good at heart and reasonable, that the oppressor or tyrant only need enlightenment brought about by the suffering of the oppressed. This is rarely true in human history and endangers civilization. The Gandhi quote below proves the naiveté his non-violent pacifistic stance. He directed these words of advice to the suffering of Jews in Germany during the Third Reich. I shudder to think what the world might look like if Gandhi had been the leader of England and not the proponent of moral violence, Winston Churchill. Granted, civil disobedience works when the goodhearted and reasonable outnumber the evil and unreasonable. It works better than violence although not immediately when you’re dealing with a Winston Churchill or Lyndon B. Johnson because there is a chance to create opportunity for reasoning together when a culture values human life. MLK appealed to the founding fathers’ principle of liberty and pointed this out to the white majority. He used the Constitution against the decedents whose forefathers wrote it. That was simple and brilliant. Translation: I've stopped thinking. I give up. The British ruled India, but they were basically civilized people who finally listened. They ‘tolerated’ Gandhi’s active pacifism. They let him slide. But, they knew, based on their own moral standards, that Gandhi held the moral high ground as did King. The British realized, as did Americans with the Civil Rights movement, that they were contradicting what was supposed to be their own values. That’s why it worked. The philosophy of non-violence or pacifism only works in atmosphere where people are willing to reason. Pacifism will not work against Islamo-fascist, Nazis, drug cartels, or terrorist. I think if you move to a universal stance of non-violence it’s an immoral position and will ultimately result in murder and tyranny.